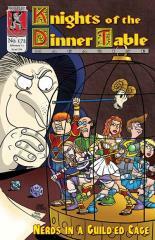 #172 "Nerds in a Guild'ed Cage"
David Reddick is an award-winning cartoonist whose projects include Legend of Bill, The Trek Life, Gene's Journal, and the Garfield comic strip. He and cover wrangler Mark Plemmons are both fans of gamer web series The Guild, thus spawning this cover parody with the Knights of the Dinner Table (along with Patty as Cyd/Codex and Sheila as Tinkerballa) as the Guild's “Knights of Good”. •Has Johnny lost his mojo? •Dice luck's being redistributed - and everybody wants in. •It all hinges on one more roll. •Who dares unwrap the tinfoil cocoon? •Can Pizza-A-Go-Go handle a night of role-playing? •Bob and Shiela unwind in front of the tv - and Bob gets a shocking phone call. •One of the Knights is in the hospital - but the game must go on.